The following testimony is from Faith Comes By Hearing. 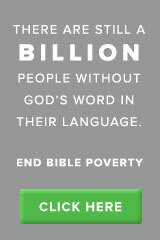 This organization works with Wycliffe to turn the written New Testament into audio form. We work with them in Cameroon and this testimony comes from a village near Yaoundé, the city we live in. I host a listening group in my home, but was ill and suffered from painful eyes. One of my relatives who works in Yaoundé proposed to take me to a doctor there. I was happy that there was a possibility of solving my problem, but I was not ready to miss the listening. 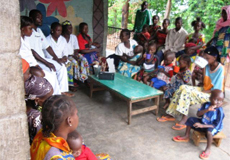 It was a dilemma to choose between going to Yaoundé for treatment and attending our group. After a few days of thinking and praying, I decided to stay in the village and continue the listening. During one session, I heard how Jesus healed a blind man and I prayed in my heart, asking him to heal me also. After this prayer, I started to get better and the pain decreased. A few days later, I was able to see clearly and the pain had disappeared. I trusted Jesus and He didn’t disappoint me. This entry was posted in Cameroon, Wycliffe and tagged Cameroon, Faith Comes By Hearing, Wycliffe, Yaoundé. Bookmark the permalink. Faith does come by hearing – and hearing by the Word of God. What a great testimony.